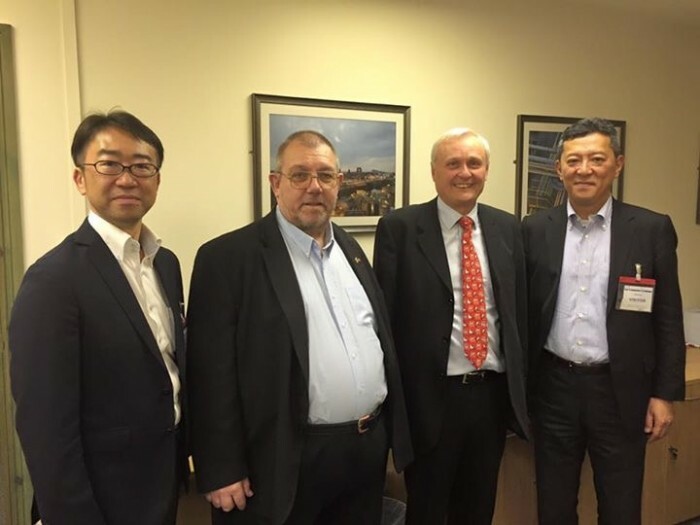 In October a delegation from Nomura Jimusho of Japan visited Chemoxy in the UK to discuss business development opportunities. Ken Sato, Managing Director of Business Department 1 (right) and Hide Sasaki, General Manager of the Speciality Chemicals Division, Business Department 1 (left) , visited the Middlesbrough Site where Chemoxy have sophisticated reaction distillation capability for speciality chemical production. The team met with the Chemoxy CEO, Ian Stark; Commercial Director, Paula Tinkler; Commercial Manager , Isabel Rumoroso and the Global Business Development Manager, Brian Tarbit. Together the two companies are working on a major toll manufacturing project for Japanese petrochemical company looking at methyl end-capping. In addition Nomura Jimusho are developing the Japanese market for some of Chemoxy key performance products including Chemoxy’s low VOC coalescents – Coasol™ and Estasol™ ; DnBE; EGDA and Diisopropyl malonate. Further the team are preparing to launch ChemoxyCare™ 8 (Caprylyl Glycol) in Japan when it joins the Chemoxy portfolio as a new product in 2016. Nomura Jimusho are conducting market research in cosmetic sector to identify sales opportunities and both Parties are excited by the opportunities this addition to the Chemoxycare range presents. The Nomura team is also enabling Chemoxy to participate in the Agrochemical Sector with Chemoxy’s efficient and high rectification distillation plants able to supply low cost, high purity early stage liquid products. Utilising the same skills and different chemistries, they are also helping Chemoxy participate in the F&F Market.